JusWondering… Is There A V.P. Nominee Curse? Now don’t get your britches in bunches thinking that this post’s title is about nominating suggestions for AVP (Alien Vs. Predator) type battles (although I’d watch E.T. fight a cougar like Dee Wallace in a cat suit… yowza! )… or that’s there’s some kind of curse associated with either of those cursed movies (or the inevitable third film). The Sarah Palin Book Signing Tomato Toss. 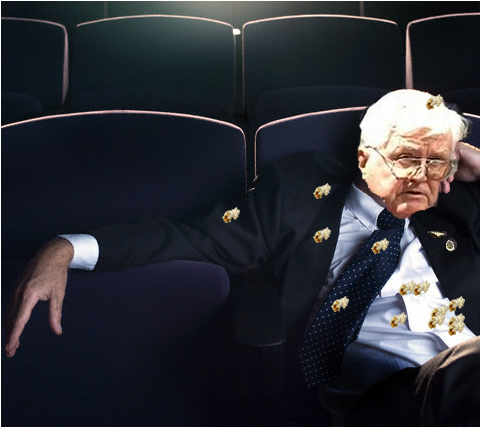 Pictured: Ross Perot's Vice Presidential nominee, Admiral James Bond Stockdale, napping after yelling at the kids that threw popcorn on him.